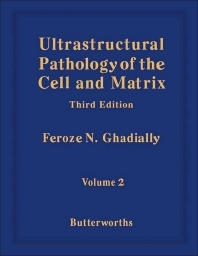 Ultrastructural Pathology of the Cell and Matrix: Third Edition Volume 2 presents a comprehensive examination of the intracellular lesion. It discusses the analysis of pathological tissues using electron microscope. It addresses the experimental procedures made on the cellular level. Some of the topics covered in the book are the structure, distribution, and variations of rod-shaped microtubulated bodies; morphology of intracytoplasmic filaments; melanosome-producing and melanosome-containing cells in tumours; myofilaments in striated muscle; and pathological variations in size, shape, and numbers of microbodies. The intracytoplasmic and intranuclear annulate lamellae are fully covered. An in-depth account of the classification, history, and nomenclature of lysosomes are provided. The morphology and normal variations of melanosomes and anchoring fibrils are completely presented. A chapter is devoted to the endocytotic structures and cell processes. Another section focuses on the classification and nomenclature of fibrous components. The book can provide useful information to cytologists, pathologists, students, and researchers.